(Nanowerk News) What if you could fashion a molecular system that could fight iron deficiency in developing nations? A system that could be grown and distributed in something as simple as yogurt. Sound like a long shot? Well, a team of Northwestern University undergraduate students did just that this past October to win the gold medal at the regional level of the International Genetically Engineered Machine competition (iGEM). Using a mix-and-match collection of chemicals found in nature, the team developed a compound that lets the body break down phytic acid in the digestive system, which, in turn, releases iron and other useful nutrients. The kicker is that the system can be grown in yogurt – enabling a cheap and easy form of distribution to people in the developing world that need it the most. Iron deficiency is a problem that affects more than 30 percent of the world’s population, primarily in poor nations. This is just one example of the promise of synthetic biology. 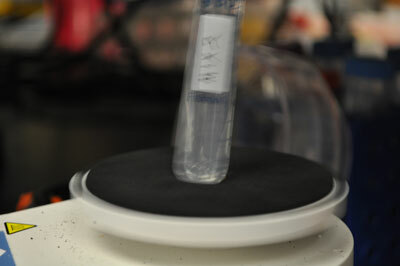 Using the vortex machine in the process of transforming yeast DNA to make insulin. The emerging field blends engineering, biology and chemistry together in a way that allows scientists to essentially custom-tailor organisms, enabling them to function in desirable ways that they wouldn’t otherwise be able to do. Synthetic biologists view DNA and the genes they express as “a bit of a parts store,” says Laurie Zoloth, bioethicist at Northwestern University. That’s because, increasingly, researchers are using the processes to take out certain parts sequences from one organism, implant them into another and create a new system entirely. Another way to look at it is to view “DNA as being like a computer program giving cells instructions on how to function,” explains Keith Tyo, assistant professor of chemical and biological engineering at Northwestern University. It’s Tyo’s job to edit that program. “Synthetic biology is saying at the molecular level – at the chemical level – all life is just a matter of putting together chemistry. And, in fact, DNA in carbon-based life forms are all based on the production and interaction of proteins,” explains Zoloth. One such game-changer would involve using the exciting technological possibilities enabled by synthetic biology to address some of the technical problems related to health care, particularly in regions of the world where high-tech hospitals and labs are non-existent. Although much of the inequality in the world is due to policy and societal issues, says Tyo, but much of it also has to do with unequal access to technology. Tyo also acted as an advisor for the team of undergraduates who were responsible for creating the system to combat iron deficiency. Some people (like this reporter) might wonder if the technology might be applied to sci-fi-style projects: to borrow the molecular instruction set for gills from a fish, for example, and transfer it into human DNA, thus enabling us to breathe underwater. Such things are theoretically possible, Tyo says. But he’s much more focused on practical problems of health care inequality that beset the world today. Zoloth, who also works closely with Tyo regarding the bioethical concerns of this emerging and powerful science, agrees with this sentiment. One of the ways Tyo and his team are currently trying to address these issues is to make much more cheap and accessible forms of drugs for HIV, tuberculosis and malaria. “We’re not really trying to make new drugs, but we’re looking at FDA-approved, quality drugs that we have here in the U.S. and spend $10 a dose on” and trying to cheaply manufacture them in ways to make them more affordable and available for low-income countries,” explains Tyo. A key ingredient to make this possible is yeast. Yes, the same yeast that you can buy from the grocery store can be refashioned using synthetic biology to help make drugs that can fight the world’s most devastating diseases. Among other things, the fact that yeast doesn’t require refrigeration may allow production of medicines in developing nations where refrigeration isn’t easily accessible. “We can program and manufacture yeast very, very cheaply,” says Tyo. One example of what Tyo and his team are working on is manipulating the sensory apparatus in yeast cells to detect signs of disease within the human body. Tyo sees this process as trying to make a cell perform similar functions as that of a lab technician in a hospital. What Tyo and his team are trying to do is just tweak that process so that instead of detecting grape sugar, the yeast cell –- serving in a diagnostic role -- would detect tuberculosis antibodies in your blood, for example. The goal then would be to use yeast to cheaply manufacture the drugs that could be used to fight such diseases, such as Tenofovir to combat HIV. Tyo says that his lab is now in the "computational phase" -– trying to decide which particular program to put into the cells. But Tyo carefully acknowledges that the same technology that he’s using to make the world a more fair and just place could be used to do just the opposite. “There is the potential for synthetic biology, like any powerful technology, to be used as a force for good and a force for evil and we do think a lot about that as a community,” says Tyo. A crucial way to safeguard against the misuse of synthetic biological technology is self-regulation and precautions. Tyo says there’s now a push to better educate the scientists on societal and ethical issues, requiring ethics courses on both the undergraduate and graduate level for aspiring synthetic biologists. While conceding the very serious risk of this technology going awry, both Zoloth and Tyo maintain that the potential good that can come out of this technology is too promising not to explore. Think of using photosynthesis to turn light into electricity, for example, or creating cheap, healthy synthetic foods in time of famine. Both those promising concepts are at least theoretically possible, says Zoloth. Jay D. Keasling, professor of chemical and biomolecular engineering at the University of California at Berkeley, has already used the techniques of synthetic biology to accelerate the production of artemisinin, a drug that combats malaria, which kills an estimated 800,000 people per year.